is smitten with this guy. 3. Parties! Growth! Cakes! Ashleigh turned 8, Sarah turned 10 and Lauren turned 7 in 2013! 5. This guy and I celebrated 11-years of marriage. Longest relationship ever. 6. Visitors! My folks and Aunt Nancy came to visit us over Easter and my mother-in-law came to visit us in October. We manage pretty well without having a guest room! 7. I was able to travel a couple of times last year to visit dear friends. I met my Carol in Buffalo, NY in January and then flew home to celebrate the wedding of my dear friend Shannon. In December, we drove to Philadelphia to celebebrate Christmas with Andy's Uncle Butch and Aunt Judi. I think we would have done more over the summer if we didn't have a puppy. There's always this year! 8. When I didn't have a hip injury, I really enjoyed running with friends in 2013. I did a couple of 10K pub runs and some 5Ks here and there with these great ladies. I cannot fully explain my love for running, but when I couldn't run for 4 months, I really missed it. 9. We made some progress painting the interior of our home and have high hopes to finish it at some point this year. The official wall color, as we named it, is "Weimaraner greige." To quote my friend Rachel, "Where's Beau? He's camouflaged!" 10. Christmas in Philadelphia is a highlight of 2013, as it is still fresh in my mind. Butch and Judi have a wonderful home built in 1900 and it includes a full-sized sleigh in their Virginia Room-- this is a favorite shot through the doorway. Here's to new adventures and making new memories and friendships in 2014! 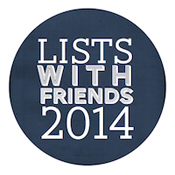 This post is part of a list-making project called Lists With Friends 2014, an effort to document the year in lists of all types.